Waterworks Industries Inc has a fleet of dredging vessels and dewatering equipment equipped with the latest and best available technologies that allow us to innovate and design precise, cost effective, environmentally conscious and safe dredging projects. 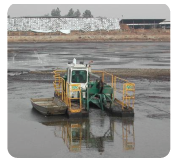 Our mobile equipment is built and designed to dredge, extract, and de-water materials from lakes, ponds, lagoons, and tidal waterways. Outlined below are a list of the types of customers we have provided services for over the past fifteen (15) years.